One year ago, a shelter for homeless men was opened by the leader of a Baptist church. Juan Araya was himself a recovered drug addict who had been homeless. He believes God saved him from his addiction, restored his marriage and family and has changed his life completely. Juan wanted to pass this blessing on to others. 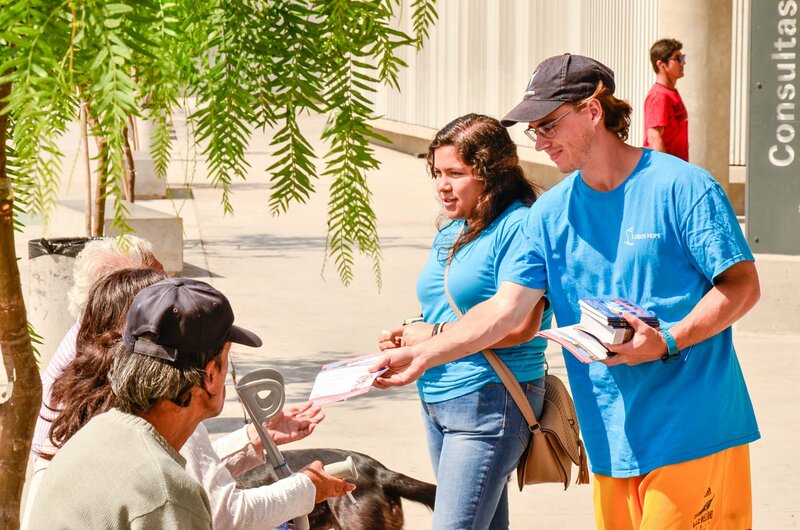 A group of Logos Hope volunteers visited his shelter on the outskirts of Antofagasta, to share a message of restoration and peace to a group of men who are experiencing challenging circumstances. Serena Poobalan (East Asia Pacific) told the men her story: “Everything was in my head but not in my heart. When I began serving on the ship, some of my friends told me their testimonies and told me about the love of Christ in their hearts,” she explained. “I decided that I wanted to know this love too. I prayed about it and God answered. That’s what changed my life,” she said. When the crewmembers asked the homeless men to share their stories, many volunteered to talk about the hurt they had gone through, on the path of drugs, criminality and addiction. Tears were shed as they all concluded that Jesus was their only way to forgiveness and salvation. Juan shared his own story of being a drug addict for 20 years. After an emotional speech, he told the residents: “God restored my marriage and I decided in faith to serve Him. I believe that the same God who liberated me is in you." Juan encouraged the men to accept Christ's love, saying that God had put men and women from all across the world together on a ship, and brought them to their city. "How could we silence the love of God?” he challenged them. Antofagasta, Chile :: A team of Logos Hope crewmembers pray for patients and their relatives at a hospital.